She said Mother Mary told her mom not to be afraid, and instructed her to look at the wall. 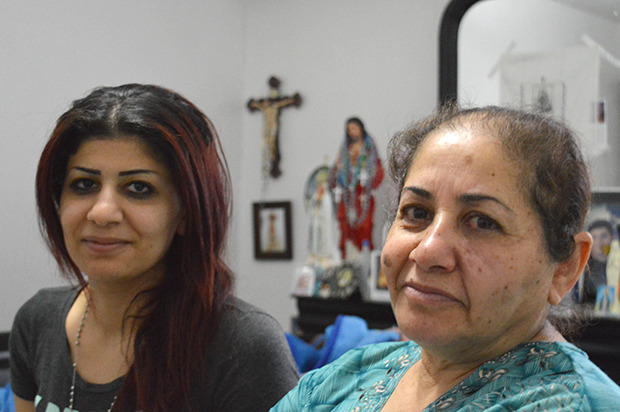 "She looked at the wall and the oil came"
Sanaan Alyais, right, and daughter Sandy say the Virgin Mary has appeared in their home. Bottom photo is oil seeping from wall that that Blessed Mother told Sanaan Alyais to look at. News report - A sign from God? January 22, 2016 - Reported [here] and [here]. Video news report [here] and [here]. Has the Virgin Mary come to Surrey? Something special is happening in suite 315 of Guildford's Evergreen Apartments. Over the past two weeks or so, hundreds of people have come from across the Lower Mainland to see for themselves what the apartment's tenants believe to be a manifestation of the Virgin Mary. An oily substance appears to be seeping from a wall, small statues of Jesus and Mary, and a vanity mirror in Sanaan Alyais's bedroom. It's become a shrine, heavy with Catholic iconography and the scent of incense. A rosary hangs on the white east wall, from which the clear substance looks to be sweating. People have been learning about the "miracle" by word of mouth, says Sandy Alyais, Sanaan's 20-year-old daughter. About 900 people — a little more than 60 each day — have come from Vancouver, Richmond and elsewhere, she said. Some have touched the oil, and many pray. The Alyais family immigrated to Canada from Iraq in 2010, and are devout Roman Catholics. They have lived in the apartment for about three years. Sanaan, 53, speaks Arabic, not English. She sat quietly on the edge of her bed as Sandy told her story, A few Sunday nights ago, she said, her mom was awoken at 3 a.m. with a vision of her son, who died in Iraq, and the Virgin Mary. At about 11 o'clock that same morning, Sanaan was cleaning her room when she felt someone touch her right shoulder. "She was so scared," Sandy related. She said Mother Mary told her mom not to be afraid, and instructed her to look at the wall. "She looked at the wall and the oil came," Sandy said. "She was so scared." There was a small line at first. "After, come more oil." Some of the oil has since trickled down to the carpet. Sanaan called for her family to come have a look. By Sandy's account, the Virgin Mary told her mom, after a while, to instruct visitors to not touch the oil, because they were touching her face. "She said nobody touch my face again." "Just my mom can see her, not us," Sandy said. Asked why the mother of the Son of God, creator of the heavens and earth, would bother to dribble oil from an apartment wall in Surrey, B.C., they have no explanation. But the Virgin's message to her mom, Sandy said, has been clear, and that is to encourage believers to pray for people suffering in Iraq and Syria. Will they have the oil be tested? "No, my mom she doesn't allow it tested, because Mary told her nobody test it," Sandy said. The building's manager has not yet joined the pilgrimage but is aware of the situation. "I have no comment," she told the Now, through an intercom box. "The manager, she know about that," Sandy said. "My dad told her like what happened exactly here; she don't come see." Meantime, there have been similar cases of such "miracles" happening elsewhere in the world, many of them connected to the Virgin Mary. In 2013, roughly 2,000 people visited a home on Membertou First Nation land, in Nova Scotia, after an oily image of the Virgin Mary appeared on a bedroom wall. The homeowner converted the room into a religious shrine. Similar occurrences have been reported out of Union City, California, and Montreal. During the Christmas of 2009, a yellow oily liquid began weeping from a bedroom wall in a bungalow in Australia. It had been the room of a teenaged boy who died in a car crash three years prior. The family was Catholic, the bedroom was converted into a religious shrine and — get this — it happened in a community called Guildford. Coincidence?